When hunger strikes in OWA and you’re looking to roll your sleeves up, grab a seat at the Groovy Goat. The sign outside has a hippie-inspired goat with a satisfied grin–you can draw your own conclusions. But Andrew, the Owner of Groovy Goat, claims that the name has more than one meaning. There is no mistaking Groovy Goat for anything other than an epic sports bar. There is a TV at every booth, big screen TVs and a massive bar. You can even find your favorite college logo tagged on the wall with spray paint. Forget about the cheap wings tossed in mass produced sauce. Groovy Goat is boasting a scratch kitchen. And if wings and sports go together, so do sports and nachos. Groovy Goat is quite literally rolling out some killer nachos–no, really … they have a nacho cart! The nachos are prepared tableside and you get to call the shots. These nachos are huge, so you’re going to need to bring some backup. 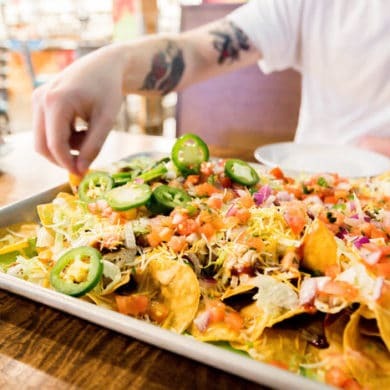 “I always say that the nachos are dinner for two and an appetizer for four,” says Sham, our server. The big games might be on TV, but the Groovy Goat also has a ton of games you can play in the arcade just next door. Challenge your friends and family to over 40 interactive games. The Groovy Goat team will even serve you inside the arcade! Kick back and chill for a while at the Groovy Goat. The Groovy Goat is located at 106A South OWA Blvd., Foley, AL. For more information, visit the Groovy Goat website or call (251) 999-4628.